Well, it's pouring down rain here in the Fort Worth area of North Texas! I'm hoping our back yard doesn't flood into the house, as it's supposed to rain all day. As I was going to get my Starbuck's this morning (necessary to stamp with on days like today), I already noticed one of the large drainage structures behind a nearby shopping center filling up and it's only been raining for about 2 hours now. (It started at 8am and it's now 10am.) Good thing I have a window right next to my desk so I can keep an eye on it all day while I'm stamping! Meanwhile, Hopper, our Rat Terrier is in his kennel in the garage staying dry and trying to dig his way to China through the metal bottom piece. That will be hard to deal with all day. Maybe after 10 years of trying, today will be the day he'll finally make it. Good luck, there, buddy. Anyway, I'm really trying to make this pretty short, to maximize my stamping time today as my babysitting job ended yesterday and I am kid free until 11:30 this morning. So here's another Sneaky Peeky of a new set from Verve called Because of You. It's a wonderful set to celebrate all the fabulous women in your life and a perfect Mother's Day set to have. I incorporated the SCS sketch challenge for this week as my layout (SCS224) and decided to bling it up with a rhinestone flourish sticker from Prima. I wasn't sure I liked this card at first, but the more I look at it, the more I do. Tonight is the Verve release and below I have some news you can use regarding it. Off to stamp! Ope! And I don't hear Hopper digging in his kennel anymore! Maybe he finally made it to China, or fell asleep trying. I bet he's dreaming of becoming a ninja dog right now. Verve's next release is just around the corner (this Friday night, April 17 at 9 PM Eastern) and we're so excited to share the new designs with you! In the meantime, we thought we'd have a little fun and host a few challenges for you this week. Sound like fun? Well, lets get started!! HERE is where you can find the challenges. And HERE is where the release party will be. See you there! 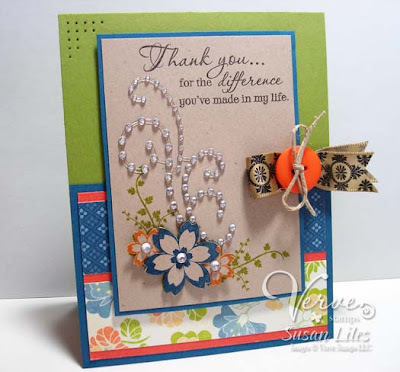 SUSIE Q-TIP: Try using Kraft cardstock as your main panel color instead of white. It goes with practically any color combo! OMG, this is a beaute!!!! Love it and can't wait for my new sets! HAHAHAHAHA!!! All I can see is Hopper kicking and fighting is way through town as he jumps out of the whole he dug!!!!!! Of course, he is wearing his ninja clothes...HAHAHAHA!!! Oh and the card is absolutely beautiful!! !